Authors Steve Chandler and Scott Richardson prove that sometimes the simplest ideas make the most sense. Residents of the corporate world will identify with their observations and, in most cases, will agree with their recommendations. The book moves along rapidly, is loaded with inspirational gems and may encourage leaders to rethink their managerial style. One curve ball: if you have trouble relating to sports analogies, look out – this book is full of them. Despite this, the authors succinctly explain 100 straightforward nuggets of motivational advice in short chapters laced with pithy quotes. These techniques must be applied, not just conceptualized. As the authors warn skeptics, practice makes perfect. 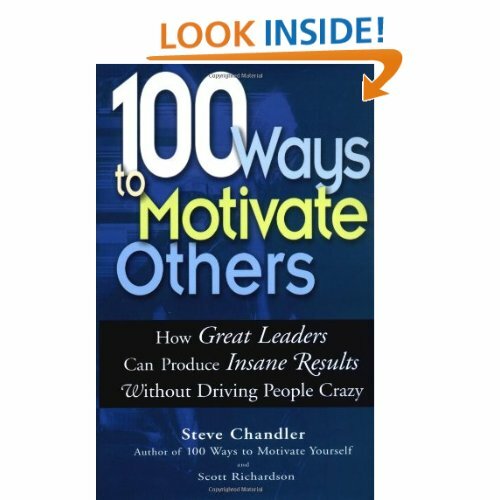 I believe that managers or executives interested in getting the best out of their employees – particularly by helping them feel self-motivated – would be wise to invest an evening with this book (and you’ll find some dandy motivational quotes to use in your next meeting). Managers like to think that they can do many things simultaneously, but even the most effective manager can only tackle one problem or deal with one issue at a time. Many times, your mind may seem to be racing at 100 miles an hour – tomorrow’s meeting with the vice president, the project that’s due in a couple of weeks, the inbox full of e-mails. But if you allow your mind to dart from one thing to the next, you easily can become overwhelmed. In most cases, that will increase your stress, build tension in your workplace and harm employee productivity. As a manager, combat feelings of being overwhelmed by establishing priorities. Decide which phone call to return, deal with the person who called in a calm, intelligent manner and then turn to the next task. Resist the temptation to think ahead. Managers frequently make the mistake of coddling those employees who seem to experience the most emotional turmoil. Managers get caught up in this tumult to be liked, and to keep that attitude of constant churn from becoming contagious. The end result resembles a father-son or mother-daughter relationship, which is doomed to fail in the workplace. You can’t send an employee “to your room” if he or she fails to meet deadlines or submit reports. However, you can appeal to an employee’s professionalism and explain why a job must be completed. Feelings and emotions have little to do with such agreements. Establish a relationship that makes the employee feel accountable. A positive attitude is always better than a negative attitude in the relationship between a manager and a team member. Embrace every opportunity to be uplifting, whether you are suggesting a team-building exercise or giving someone a pat on the back. Welcome contributions from team members rather than rejecting ideas out-of-hand. When you embrace an employee’s idea, you elevate yourself in the eyes of your team members and convey the advantages of having a positive attitude. Think about the batter who steps up to the plate in the bottom of the ninth. The team is losing by a run; the bases are loaded. Two outs. The third-base coach calls time, meets the batter halfway down the baseline, puts an arm over the batter’s shoulder and says quietly, “Just relax up there. Take it easy. Don’t squeeze the bat so hard. Don’t worry, you’ll be fine.” The coach knows that acting nervous or pressuring the batter would be counterproductive. Such behavior could convey anxiety to the batter, who might then fail. The same principle applies to the workplace. Nervous employees probably will not achieve maximum productivity. But employees who see that their manager is relaxed and patient may well adopt the same attitude. To motivate your team, be positive and calm. At a professional or college football game, frequently you will see that the head coach is holding a laminated sheet of paper. It contains the game plan – plays the coach feels can succeed and lead to victory. Success is not haphazard, nor is it based on feelings. Those who plan ahead enter their offices each morning knowing how much time they are going to spend on the phone pursuing sales. They make decisions based solely on business strategies, not on mood or on how upbeat they feel that day. People who get things done feel good about themselves and develop solid self-esteem. Leaders determine their goals, figure out how best to achieve them, set the wheels in motion and follow through. Although many managers are reluctant to deal in numbers, that’s really the only way to keep your team members apprised of their progress, tell them what you expect and show them how they can improve. Imagine a coach sending a play to the quarterback without knowing how many yards the team needs, what yard line the team is on or what the score is? As a team leader, you need to know the score and to be able to discuss scoring more points. A coach may applaud his quarterback for trying to score, but ultimately if the quarterback can’t get into the end zone, the team will get a new quarterback. Your salespeople need to keep their eyes on the scoreboard at all times. They need to know when they’re winning or if they need to adjust the game plan. Too often, the hiring process doesn’t get enough emphasis. Companies get stuck with underachievers, yet managers fail to acknowledge that more thorough job interviews could have detected the failing employees’ fl awed personality traits. Because the hiring process is so crucial and a poor hiring decision ultimately can be quite costly, managers need to make a more serious investment in this aspect of their jobs. Start listening carefully to each candidate and trying to zero in on his or her true motivations. During the interview, try to get a sense of the candidate’s personality. Just look at the rigorous process that NFL teams utilize to screen players coming out of college. Even though coaches usually have no questions about the young players’ physical abilities, players must undergo psychological and personality testing. After all, a general manager who guesses incorrectly could be stuck with a nonproductive malcontent, just as a sales manager could be stuck with a melancholic non-achiever Frequently, salespeople who fall short of their goals, fail to meet their quotas and generally are a source of frustration, all suffer from the same core malady. They want a job but they lack a strong desire to succeed. A smart manager must be able to diagnose that condition. Many managers, especially those recently promoted to positions of authority, think they always have to be right. They believe everyone will scrutinize them now that they have been promoted, so they can’t afford to be wrong because that would show weakness. They believe their credibility will be affected if they make a mistake or don’t know something. Quite to the contrary, a manager who admits mistakes and is willing to accept team members’ suggestions graciously will gain infinitely more respect and become a source of inspiration. Who is right and who is wrong doesn’t matter. Reaching goals and achieving success is the ultimate barometer. Great leaders make mistakes all the time, but the key is whether they are able to extract the very best from their people. Although they are involved in serious work, good managers try not to take themselves too seriously. They may be disappointed when something doesn’t go well, but instead of plunging into self-doubt and depression, they pick themselves up and attempt to resolve the issue from a different angle. Instead of spending time worrying or over-analyzing a failure, they try again. In the workplace, especially during challenging times or even when business strategies fail, it is easier to be pessimistic than optimistic, but that’s a wrong turn – especially when your team members are looking to you for a psychological boost. Memorable bosses maintain their optimism through the most challenging times. Almost every successful business leader has had a coach – someone who brings out their best qualities and helps them reach their potential. In years past, business people didn’t think of themselves this way, although in sports and other fields most successful people can point to an individual who particularly influenced their lives. Now, the business world offers many “success coaches.” Take advantage of their expertise. However, if you enlist a coach, heed the advice you get. Coaching is useless unless it’s applied. To lead, first embrace the principle that change is good. A good leader advocates change, instead of defending the status quo. One of the biggest mistakes a manager can make is to apologize for change and lament the passing of “the good old days.” Few companies can progress without implementing change, refining techniques and exploring new options. However, realizing that many employees are uncomfortable with change, managers often attempt to ease their staff members’ discomfort by sending the message that change is not welcome. This “I feel your pain” approach doesn’t work. In fact, it can do a great deal of harm by undermining the team’s ability to adapt. Point out all of the positives of change and tell your team the benefits of working for a company that has the vision to welcome change. It takes only three months to create a habit, good or bad. Routine builds good habits. Just look at a successful major league baseball pitcher. In all likelihood, he can tell you his game day routine down to the minute. He eats his pre-game meal at the same time, arrives at the ballpark at the same time, and does his stretching exercises and warm-ups at the same time. He has programmed himself to succeed by using this routine. Imagine a teenager who has a messy room, but who sincerely desires to become neater. If she starts by tidying her room 15 minutes every day, eventually the results will encourage her to do more. Soon, she’ll find herself straightening up instinctively. Sometimes, a lack of routine is the only thing that stands in your way. Even something as seemingly mundane as checking e-mail can be turned into a productive routine. Instead of checking your e-mail every 15 minutes, only check it twice a day. Pretty soon that will be a habit, too. One basic principle is essential for workplace success: Disagreement is not productive. When you are in the midst of discussions with team members, try to extract nuggets of valuable information rather than flatly saying, “I disagree.” That attitude can be very deflating and may make employees reluctant to participate in discussions. Watch effective teachers solicit answers from the students in a classroom. Even if a student does not have exactly the right answer, the teacher will try to reframe the answer and pull out something positive. Or the teacher will say, “Good. Now what about the next step?” Managers who are receptive to their team members’ input provide motivation. Constant disagreement just demoralizes employees. Many “old-school” bosses still believe that the best methods for motivating employees are intimidation and raised voices. Although old-time bosses may not admit it, feelings matter and managers must consider them. The typical workplace is not the Army, where the commanding officer issues an order and people follow it without question. Since most business communication now seems to be accomplished through electronic mail, take the opportunity to send positive messages. Put yourself in the recipient’s shoes and determine if the e-mail you are about to send is uplifting or deflating. Nothing works as well as positive reinforcement and e-mail enables you to send encouraging lessons often. Almost all employees can tell you what time of day they are most productive. Some people are at their energy peak when they walk in at 9 a.m., sit down and switch on their computers. Others do better when they’ve just returned from lunch. Managers who have a lot of responsibilities should tackle their biggest projects when they have the most energy. When you’re tired or distracted, postpone difficult tasks. Sometimes, managers can feel absolutely overwhelmed, convinced that they do not have enough time to answer e-mails, handle faxes and respond to company superiors. Negativity can creep in quickly. You may even complain that your job is “awful.” It’s easy to be too serious and lose perspective. But would a person who just returned from the food stamp office or who just received a shutoff notice from the electric company consider your job “awful?” Or would any job look good? Sometimes, you may need to reframe your thinking, approach your job from a fresh perspective and not take things so seriously. Stuck in morally questionable Business? Try ethical Decision-making!